The Closet of Hope will CLOSED the first week of April for Spring Break. Please feel free to text or call us at 616-613-6770 during spring break for help with urgent needs. See below for information on weekly open hours. Click here to access the full Event Calendar. The Families of Promise Closet of Hope is a volunteer-run resource providing clothing and other items free of charge to children (ages newborn to 18) of Foster, Adoptive, Kinship, Guardianship and Safe Families in our church and community. Families may receive clothing and supplies for new child placements and growing children, and is a resource for ALL of the children in your home. Our goal is to support, encourage and equip your family to continue to do the great work you are doing! LOCATION: Kentwood Community Church's Wyoming Campus, 2950 Clyde Park Ave. SW, Wyoming, MI. Enter through the Main Office doors, and the Closet of Hope is a few doors down on the left side of the hallway. 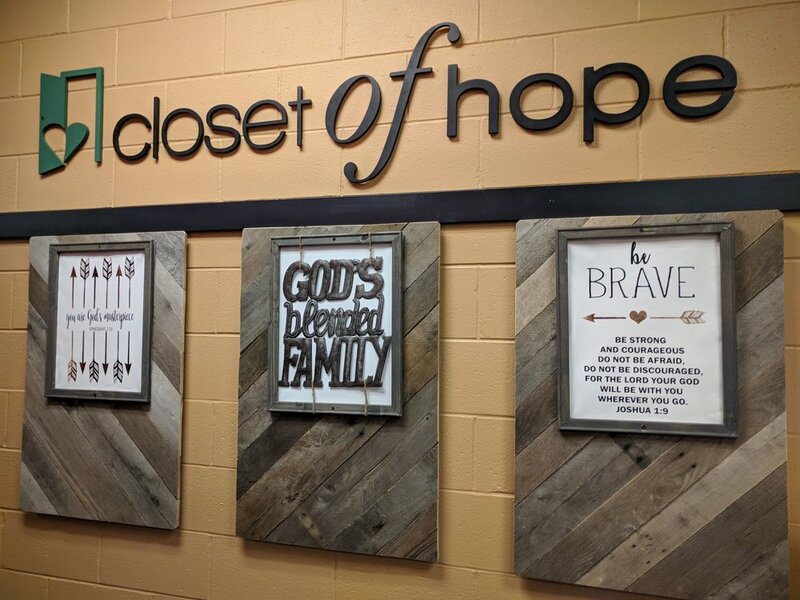 OPEN HOURS: The Closet of Hope is open weekly on Mondays from 11am-2pm and Wednesdays from 6-8pm. Appointments may be available outside of open hours for urgent needs (depending on volunteer availability--please contact us to inquire). FREQUENTLY ASKED QUESTIONS: Click here for answers to questions frequently asked by Closet of Hope users! CLOSET OF HOPE FLYERS: Click here to view/print the Closet of Hope flyer (For agencies wishing to provide printed materials to their families, pages 3 and 4 are formatted for printing 3 to a page, front and back). NOTE! Due to limited storage space and volunteer time, it helps us immensely if you pre-sort your donations and include ONLY clothing that is NOT stained, torn or out-of-date, plus ONLY adult clothing that teens would consider fashionable. Sorting by boy/girl and sizes can also be extra helpful. :) Thank you for your help in making this a quality resource for these very deserving families and kids! DONATION DROP-OFF: The best time to drop off donations is during the Closet of Hope's open hours (listed above) at 2950 Clyde Park Ave. SW. If these hours are not convenient for you, donations can be accepted at both the Kentwood and Wyoming campuses of Kentwood Community Church during business hours or weekend services. We recommend you call ahead during campus business hours to confirm someone will be available to accept your donation. Please use the contact info below if you have specific questions about your donation. FOPClosetofHope@gmail.com or (text or call) 616-613-6770.